You can also purchase a Make your own Spool Dolly kit ($7). The kit includes almost everything you need to complete five dolls. 1. What do you call yourself? (e.g., Independent designer, crafter, maker, artist) Artist and craft artist. 2. What inspires you? How do you get past crafter's block? As an artist I am primarily inspired by people and nature. I think I am often designing with children in mind, which is obvious when you look at most of my work. I have never really had a problem with “crafter’s block”. I actually have more ideas than I have time to create things. I often dream of ideas at night and have to get up and sketch them out or I can’t get back to sleep. 3. What tool(s) can't you live without? My favorite tools are a pencil and paper for sketches. If nothing else, this provides me with an outlet for all my thoughts and ideas. Outside of that my supplies range from fabrics, paints, wool, and wood, and so much more. I enjoy trying everything and am especially attracted to texture and color. 4. Who is your idol, current craft-crush? I love the work of Kaffe Fassett and Heather Bailey. 5. How long have you been doing this? I have been an artist since I was a small child. I really can’t tell you a time where there was an ‘ah-ha’ moment and I started doing arts and crafts, it’s just part of who I am. 6. Where did you learn your craft? All that I have done with my arts and crafts has been self taught. I am very lucky to have the ability (except when it comes to drawing), to see things in my mind, or in the world, and make them. 7. Do you do this full-time? If not, what pays the bills? I worked for many years before the birth of my son (from 16 to 38 years old). Professionally I was a teacher. I taught everything from special education to early childhood education. Now I am a stay at home mom so I try to do my work during naps, in the evening, and whenever I can find a spare moment. I used the money I have saved from working, and profit from sales to fund my supplies. My husband helps a lot too! I would like this to work into a full-time profession as my son gets older (he is 2 now). hi, i just found your blog this week and i absolutely LOVE it! i've already favourited a few of the artists you've featured over on my etsy...including this one! 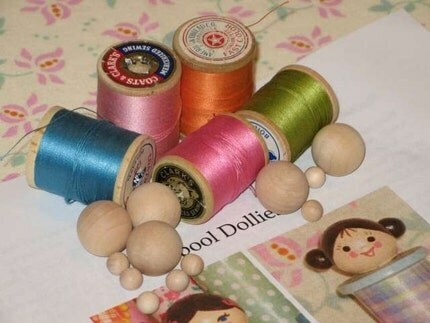 her little spool dolls are darling!! hi krissy, welcome! I'm so happy you're enjoying it! I know, aren't their faces the cutest?! Oh, adorable! I love how colorful they are! I have been loving these for a while. Sometimes the simplest things are the most wonderful! I love your blog and will be back to visit soon.